In our last newsletter we said we would be continuing with our push in 2014 to open new stores, as well as strengthen our brand awareness through shop-in-shop concepts with dealer outlets. So, we are excited to announce the first new store opening of the New Year – in South Korea. The smart looking store opened on 20 January in the capital city, Seoul. 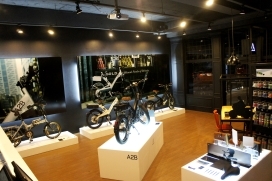 The store showcases a range of A2B ebikes, including the Alva+, Octave, our portable, foldable ebike the Kuo, as well as the award winning Shima. Other markets are working on similar branded or shop-in-shop concepts for launch this year, including Spain, Russia and Canada. We look forward to great success with the fantastic new store in Seoul.